Over the last several months, I have been slowly redesigning my website, CliffBarackman.com. 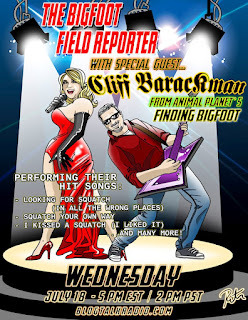 I took up this redesign as a project that I could do from the road while filming Finding Bigfoot, and it has finally reached the stage where I'm happy enough with it to share the new redesign with the world. I admit, it's not quite done. 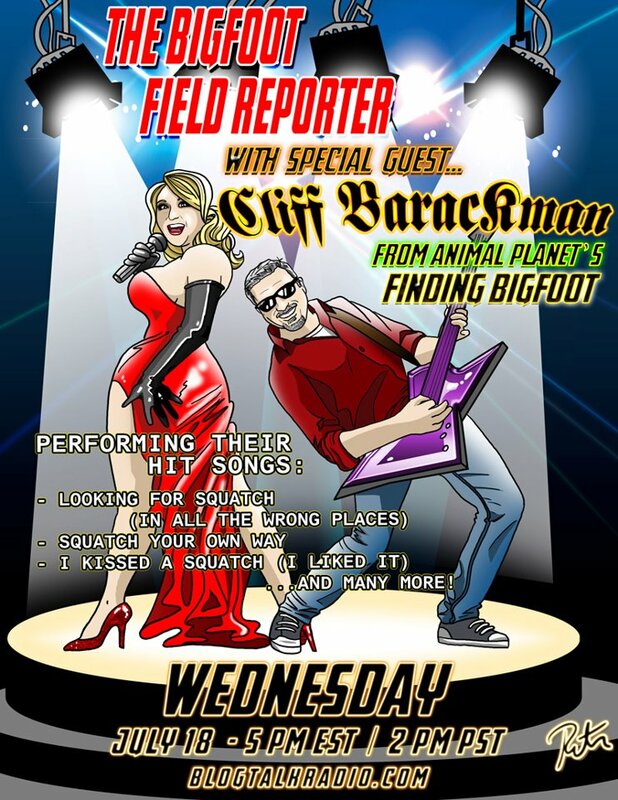 I have a few surprises in store that were not present in the previous incarnations of CliffBarackman.com, and I think you'll be more than pleased with them as I unveil them. For now, I think the site is at about 85% complete, so I'm making it public. The footprint database has a new format, as does the sound recording section. An entirely new section, entitled "Bigfoot Road Tripping" is being developed and currently includes an interactive map of bigfoot road trip attractions. I will soon add a feature where you can upload additions to this map with your own photographs. It'll be fun. Please take a moment and update your bookmarks so they point to the right place. Enjoy the new site, and look for more additions coming soon, including the long-awaited publications featuring the London Trackway. I hope you can tune in to hear the interview. If you can't, be sure to download it later! This should be fun. 2012 Salt Fork cast against a one half inch grid. On June 3, 2012 a partial footprint was discovered in Salt Fork State Park by a witness (name withheld) who was camping with his wife and two children. While walking about 200 yards behind campground A15, the witness stumbled across a large, humanlike print on a slight incline. A map of the campsites in Salt Fork State Park. The witnesses were staying in site A15. The cast is broken, but the witness estimated that it was originally 15 inches long before it broke, and six inches wide at the ball. Though the cast length cannot now be measured, the ball width can be, and in fact was. The width of the ball is 6.5 inches (16.5 cm). Not a bad estimate from the witness. Good job! I would also assume that the 15 inches in length is only approximate, and perhaps too short an estimate. 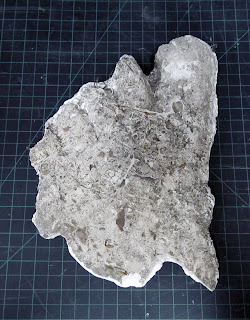 The cast is grey in color because of the sediment that still clings to the plaster. Bits of leaf litter and grass stick out of the cast here and there, vouching for it being the original. 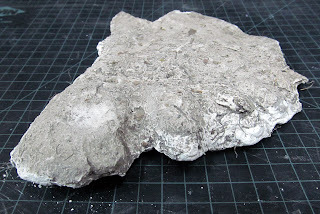 Though I cannot be sure, I’m guessing that the material it is made of is plaster of Paris due to how light it is. It is broken behind the ball of the foot, and measures only 10 or so inches long. I do not know what happened to the other half, nor how it broke. 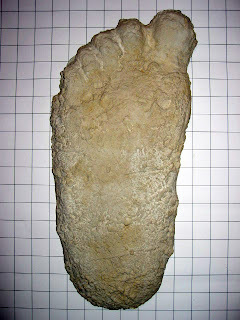 The hallux, or large toe, dominates the toe structure in this cast. Three other toes are more or less the same size, and the fifth digit, or “pinky toe” is partially broken off at the tip. No measurements were taken of this toe. 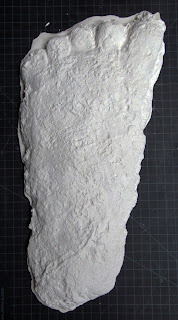 When I first saw this cast, it strongly reminded me of several other casts in my collection. 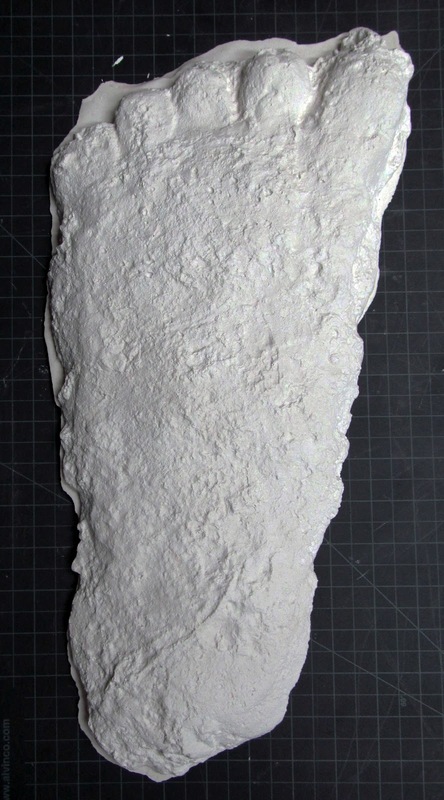 The 1963 Laird Meadow casts, the 1962 Hyampom cast, the 1958 17 inch Titmus cast, and the original 1958 Jerry Crew cast all seemed remarkably similar to this 2012 Salt Fork cast partial cast. (It should be noted that the Laird Meadow casts, Titmus cast, and Crew cast are almost certainly the same individual sasquatch. The Hyampom cast might also be from the same individual, though the distance between Hyampom and Bluff Creek (where all the other casts were taken) makes this assumption less than certain. 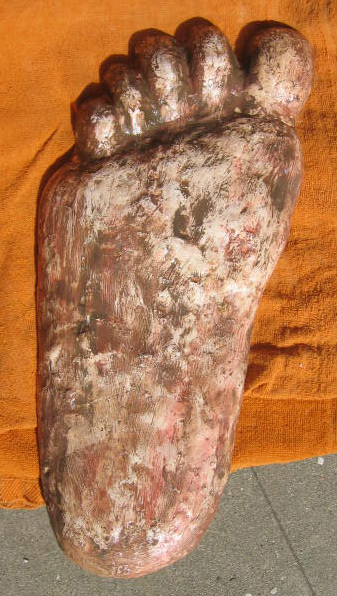 1963 Laird Meadow right foot cast. A print attributed to Bob Titmus from 1958.
or a model based on another print (possibly the 1958 Crew cast) is unknown. Several possibilities crossed my mind. One possibility is that this type of toe layout and dimensions is something that is found in the living sasquatch population, just like in humans where certain nose shapes or toe proportions are common. This type of toe design might be prevalent in the sasquatch population due to evolutionary pressures and genetics. 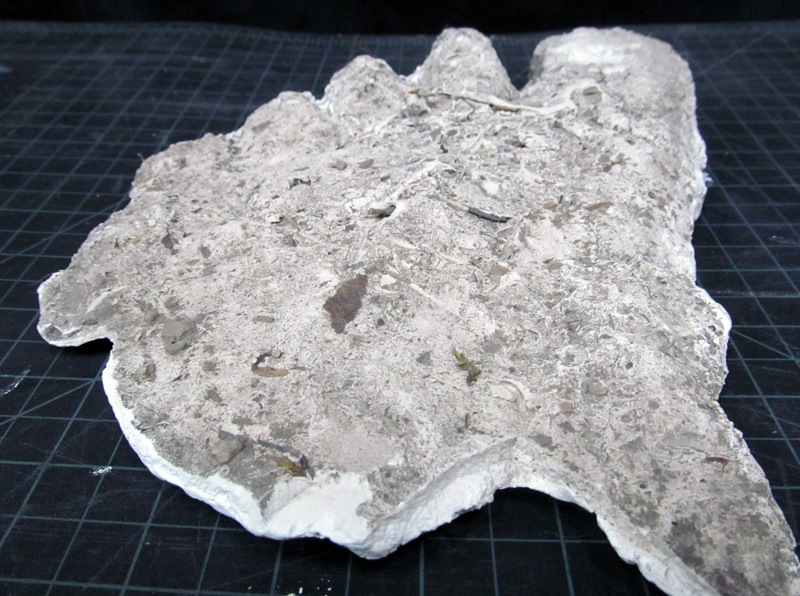 Another possibility is that the Salt Fork cast was hoaxed by using one of those known casts and impressing it into the ground. It would give a vague, yet realistic impression that strongly suggested samples from the existing data set. It would also alleviate the tedious work of crafting a prosthetic foot to do the cookie-cutter stomper-style hoaxes that have occasionally transpired over the years. To find out if this partial cast could be the result of clever hoaxers, I decided to take some measurements of the various casts and compare them. If I found the dimensions of the Salt Fork cast to be very similar to measurements from the other known casts, then I would have to consider that this cast might be a fabrication, whether or not the witnesses were in on it or not. If there were substantial differences, then the cast’s authenticity, though not proven, would be supported by the data. I decided to take measurements of various widths and lengths found on the cast. All of these casts resembled the Salt Fork cast in toe shape and size. For my comparison, I chose the Hyampom cast, right foot of the Laird Meadow casts, and the 1958 17 inch Titmus cast (also a right foot). The measurements I chose consisted of the width of the ball of the foot, and the lengths and widths of all five toes. Using calipers, I measured the width at the ball of the foot, and the thickest part of the various toes. I also took measurements of the lengths of all five digits. The fifth digit of the Salt Fork cast was broken off, so I did not record numbers for that one. The lengths were from the tip of the toe to the furthest extent of the webbing of skin between the toes, or where a noticeable bend in the digit was evident. It should be noted that this width does not reflect the true width of a sasquatch’s toes. Sasquatches, like humans, are known to have a fat pad on the bottom of their feet and toes. Observations of casts indicate that this pad is much thicker in sasquatches, which is what would be expected to protect their feet from the thorny, nasty, pokey environment in which they live. These fat pads often expand sideways into the ground (like a cushion expanding sideways when sat upon) as the bigfoot presses down on it, thus making the toe appear bigger. Looking at the numbers above, the ball widths vary widely. This is interesting not only because the above four casts might only represent two individuals bigfoots (three at most), but also that this goes to illustrate the variation that can be expected from one individual’s footprints in various substrates, points in a walking stride, and flexibility and expansion of the sasquatch foot. The first similarity that jumped out to me between the above casts was between the Laird Meadow cast and the Salt Fork cast. Both measure 16.5 cm wide at the ball. However, looking at the other toes’ measurements, strong differences become very apparent. Digit two makes it very clear that these are not the same impressions by being almost two full centimeters shorter in the Salt Fork cast. Two centimeters is too big a difference to be accounted for by margin of error. There are also some stark differences apparent in the lengths of toes between these two casts. It is clear that the Salt Fork cast was not made by impressing the Laird Meadow cast into the ground, nor any of the other casts included in this study. The view from the proximal, or back side of the print. Note the depth of the toe impressions. The Salt Fork cast might be the real thing. Its similarities to other prints in the data set support its authenticity. The numbers indicate that this cast is not the result of the most likely hoaxing method. Additionally, the toes seem to bend at the appropriate place, and there is a nice rounded contour to the surface edges that appears very natural. Salt Fork, the context of this print, is a consistent producer of bigfoot encounters with a long history that apparently continues to this day. The data stands on its own. Assuming that the witnesses themselves aren’t deranged liars (which I don’t peg them to be), I’m inclined to think this one’s the real deal. A view from the distal, or front side of the foot. This cast will be added to my ever-growing footprint database on the soon to be revealed, new and improved, and completely redesigned CliffBarackman.com. I have been quiet, but not idle. There's been a lot going on, so start dropping by here more often over the coming months.